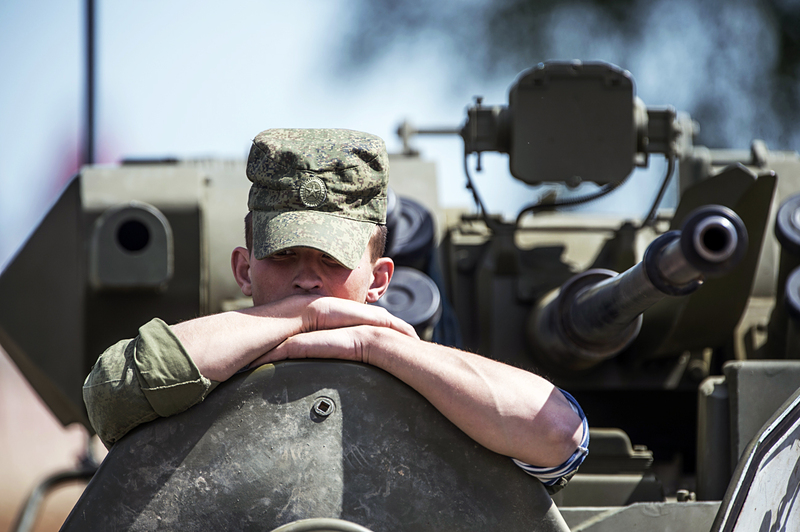 A serviceman at the Army 2015 international military technical forum near Moscow. A new report has ranked the country behind the UK, India and Saudi Arabia. However, Russia still spends a greater percentage of its GDP on defense than the U.S., China and Europe. Russia is no longer one of the top five countries with the highest defense budgets, according to a 2016 report prepared by the British analytical company, Jane's Defence Budget. The ranking places the United States in first position, followed by China and the UK. India is in fourth place, ahead of Saudi Arabia and then Russia. This means that for the first time since the 1990s Russia is not in the top five, writes the Financial Times. After the introduction of the Western sanctions and the fall in oil prices, Russia consistently began reducing the part of its budget allotted for national defense. According to Alexei Arbatov, director of the Center of International Security at the Institute of World Economy and International Relations in Moscow, in 2016 state defense expenses were planned to be at a level of 3.2 trillion rubles ($52 billion) and have been set at 2.8 trillion rubles ($46 billion) for 2017. "This is directly related to the budget deficit and the economic crisis and there are no other reasons," says Arbatov. According to various sources, Russia's defense spending amounts to about 5 percent of its GDP. This indicator is higher than in the U.S. (about 3.1 percent), China and most of the European countries (2 percent and less). The only countries whose percentage is higher than Russia's are Saudi Arabia (13 percent) and Israel (about 5.5 percent). Nonetheless, defense spending has seen fewer cuts than other items in Russia's budget, with larger reductions hitting the social areas of Russia's economy, which demonstrates the priorities for the country's leadership, adds Arbatov. The Russian government has decided to reduce financing for the "Innovational Development and Modernization of the Economy" (minus 250 billion rubles), as well as the "New Quality of Life" (90.9 billion rubles) and "Development of the Transportation System (83.5 billion rubles) programs, reported the Novaya Gazeta newspaper in October 2016. As Arbatov explains, Russia will reduce its military spending by increasing the duration of various projects, rather than canceling them entirely. In his words, part of the expenses will be redistributed within the framework of the new 2025 State Armament Program, which will replace the equivalent 2020 program. He also suggests that "some kind of economy in holding large-scale military exercises," in which up to 150,000 soldiers have previously participated, may be possible.